A few weeks ago, a group of my Iranian-American friends and I gathered after work and chatted about the current political climate over dinner. Like many millennials, we ordered food from Seamless and at the end of the night used Venmo—a “digital wallet” connected to one’s bank account that allows users to instantly send and receive money —to pay back the host for purchasing pizzas and salad for the group. When sending her contribution to the host, one of my friends wrote “Persian🍕” in the caption. Venmo users commonly include little messages when sending money to friends. But this time the transaction was flagged and blocked immediately. Why? Because the word “Persian” was included in the transaction memo. Tyler Cullis, an associate attorney at Ferrari & Associates, a sanctions law firm in Washington D.C., explained that “certain words trigger and raise a red flag with Venmo and its parent company, PayPal.” These triggers are any words that could raise potential sanctions compliance issues and require their compliance team to further review the payment to make sure it is not violating any sanctions law. “These regulations are laws, and U.S. persons acting in violation of them may be subject to civil and criminal penalties,” he added. According to current U.S. law, companies have to stop any payments if they believe it to be of Iranian origin because their facilitation, intentional or not, would be a sanctions violation according to the relevant regulations, which specifically prohibit U.S. persons from engaging in any transaction or dealing in or related to goods or services of Iranian-origin. The pizza that was ordered certainly did not come from Iran—perhaps to the dismay of many Iranians in the diaspora who swear by actual Persian pizza—ketchup and all. Plus, I would think that it would become quite soggy after it was in transatlantic transit from Tehran to Washington. Venmo’s algorithm scans for “suspicious” transactions based on certain keywords, but it is often inconsistent and illogical. When asked how one would know whether a transaction would inadvertently include a banned word or whether a list would be published on their website for further clarity, a Venmo spokesperson stated that they would not share that since users could then potentially find a way around it. While perhaps this may only seem to be a minor inconvenience, the impact of Venmo and PayPal’s targeted actions goes far beyond sending and receiving money for food transactions. Small businesses, academic departments, and nonprofit organizations have been directly impacted this blanket ban. Various humanitarian organizations have also had their transactions flagged for further review, delaying the receipt of donations. Last December, after a major earthquake shook the Khuzestan region of Iran, several individuals affiliated with larger groups hosted fundraisers to gather supplies and money to send to several U.S. based organizations with OFAC licenses. In Washington D.C., one such fundraiser was organized and several donations were blocked when users typed in “Iran earthquake relief” in the memo line on Venmo to purchase their entry to the event. Individuals and smaller groups attempting to make a small impact in their community are the ones affected given many folks don’t have cash on hand or credit card machines and Venmo is known to be a fast and effective substitute. A representative at Venmo stated that all transactions are reviewed by their compliance team for security purposes but if “something seems off, it is further investigated.” I was also told that if a transaction seems to be “against their user agreement” then it will be flagged for further review. Several provisions violate the user agreement listed on the Venmo website, however none of those transactions had been immediately flagged. If one types in “drugs,” “cocaine,” or “heroin” into the memo line—clear violations of Venmo’s user agreement which states users may not use Venmo to conduct transactions that involve “tobacco products, prescription drugs and devices, drug paraphernalia, narcotics, steroids, certain controlled substances or other products that present a risk to consumer safety”—the transactions are not immediately flagged for additional review nor blocked. It’s important to note that Venmo can only be set up by someone with a U.S. bank account and U.S. mobile number. These requirements make it near impossible for Iranians in Iran to engage with and utilize the app. So what does Venmo consider to be more problematic ? A transaction entitled “Persian 🍕” or “Cocaine 👃”? That a harmless transaction for food is more strictly regulated than a transaction which could potentially be for the sale of controlled substances reflects the stigma attached to anything labeled “Iranian” or “Persian” by users. Policing transactions with low risks of being actual sanctions violations, but ignoring those significantly more likely to be blatant violations of their own company’s user agreement and potentially abetting illegal activities, is counterintuitive. 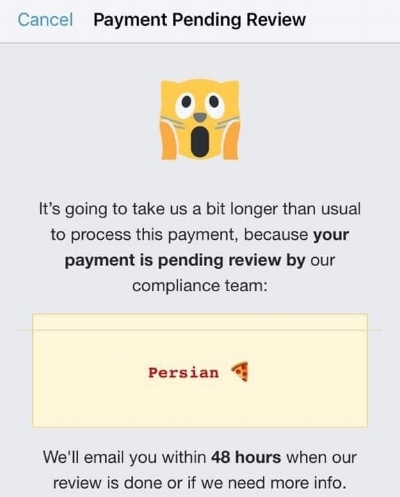 If Venmo and PayPal truly cared about users not abusing their app and making sure their transactions are appropriate, they should aim to address this issue more intelligently, and not merely implement a blanket ban against certain cultures and keywords. Samira has studied Iranian history at UC Berkeley and the University of Oxford. She is based in Washington D.C. Follow her at @samira_says. Sep 7 Can Europe Defend Itself And Iran From U.S. Sanctions?